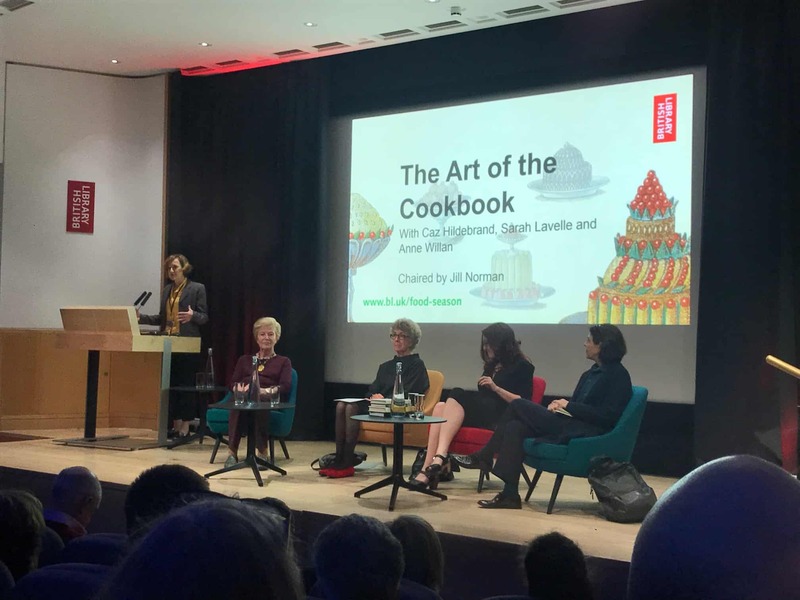 On average, people will only attempt three recipes from each new cookbook in their collection – so says Sarah Levelle, publishing director at Quadrille, who was speaking at The Art of the Cookbook, a panel discussion at the British Library last week. So, what’s the appeal? And why are new – and increasingly technical – cookbooks appearing in their droves, not only in traditional bookstores and online channels, but now in fashion retailers such as Oliver Bonas and Anthropologie? During the discussion, four speakers tracked the development of the cookery book from the earliest Latin editions to today’s highly innovative and unusual offers. Joining Levelle were pre-eminent authority on French cooking Anne Willan; award-winning designer of best-selling cookbooks Caz Hildebrand, Creative Partner at Here Design; and internationally renowned culinary expert Jill Norman, who acted as chair for the evening. Setting the scene, Willan and Norman took the audience on a winding journey through the early years of cookbook development, from the health-focused and prescriptive De Honesta Voluptate et Valetudine dating back to the 1470s, through the first mention of specific ingredients and instructions in Opera di Bartolomeo Scappi (1570), to the more modern works of Julia Child, Mrs. Beeton and Fannie Merritt Farmer, who introduced the modern recipe layout. These days the act of cooking and the books that guide it are mainly a form of entertainment, but in previous centuries these volumes were purely informative, designed to be read aloud in the kitchen to the cook – likely taken from the library and recited by one of the handful of literate staff in a large home. Drawing on her time at Penguin Books – having been given the role of creating the food and wine list as she was the only woman – Norman reflected that only in recent years has cookbook design become more complex and creative. Partly in line with the rise of image-led social media channels such as Instagram and partly due to shifting perceptions of the role food plays in our interactions, the cookbook’s purpose has evolved even further over the past few years, according to Levelle. Most recently, cookbooks have moved away from being instruction manuals with advice on creating tasty and nutritious meals to become objects that reflect who the owner is as a person – or how they would like to be seen. They are collected to serve as tomes to inspire the reader and demonstrate their tastes and aspirations from their place on the shelf or coffee table. To catch the consumer’s eye, either in a retail store or online against a wealth of competition, authors and their design teams are becoming increasingly creative in creating standout cookbooks. Levelle quoted the ‘Amazon test’ – the act of shrinking a cover image to see whether it was still recognisable as an Amazon tile – as a testing point but noted that whilst vibrant images of beautiful plates of food may catch the eye, it’s usually timeless or innovative approaches that have staying power. And whilst the cover image grabs the reader, Hildebrand delved within to consider new and varied approaches to design, from bold typography and wiro-bound cookbooks to combined tomes that offer a larger volume for keeping clean in a library and a smaller version for getting messy in the kitchen. Having found inspiration in the 1890s Italian cookbook L’Arte de Manger, where entertaining text was paired with informative graphics demonstrating technical approach, Hildebrand was inspired to craft The Geometry of Pasta, a book of technical drawings of each pasta shape at its true size, with explanations of how to cook and match with the perfect sauce. This book is a real treat for the eye so if you appreciate good design as much as we do here at Red Setter, I’d strongly recommend picking up a copy. As Hildebrand concluded, with the wealth of options available, what the sector really needs is fewer cookbooks but better. And for any designers seeking inspiration, the British Library is currently in the throes of a packed Food Season, drawing on its collection of 180 million items to explore the evolution of tastes and traditions through the ages. More details here.